It was evading me for a while there. I mean, it was really absent. I wanted to close up the house, park the car around the back, and pretend I wasn’t home. It wasn’t a ‘bah humbug’ kind of thing. Just a ‘really tired and worn out’ kind of thing. I’ve just been so tired lately that I’ve had no desire (or energy) to tackle anything at all. But somehow, a couple of days ago I recaptured the need to be creative. I took out the old broken gateleg table my first tenants had left behind and started mending it planning to use it as a dining table for Christmas. Then, since I had only a bit of a tin of Stain Cover left and it was on the edge, I undercoated two kitchen chairs which have been waiting to be painted for about a year. I also went through some booty I’d collected from trips to op shops and tip shops over the last month or so. What really got the christmas juices flowing however, was going to my friend Amanda’s yesterday and making three batches of melomakarona! 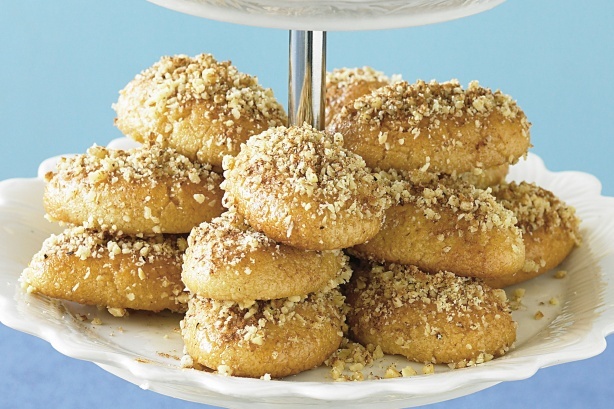 These delicious traditional greek christmas sweets are one of my favourite. I helped mom make them many times as I grew up but have only made them myself 3 times counting yesterday. Here is the recipe I use and, let me tell you, its delicious and easy! This entry was posted in food, life on the farm, ponderings by zefiart. Bookmark the permalink.